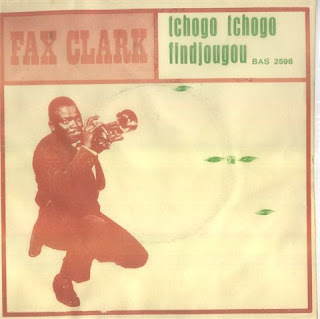 Fax Clark, 1925-1997, was a trumpeter from the Ivory Coast. Born in Taboo (South-West - Ivory Coast) he was heavily influenced by Louis Armstrong. I've seen 2 45's and a compilation with his work on it and I have somewhere in the back off my mind that he was associated with Manu Dibango in the 70's and may have owned a nightclub in the Ivory Coast. The song is called Findjougou and is off a 45 I bought on ebay. The vocals are very reminiscent of Louis Armstrong. I like the growling call and response of the lyrics and the sparse jazz instrumentation, especially Clark's thready trumpet work towards the end of the song. The afrisson website has some more information. I am glad you liked the music and thanks for checking out the site. Maybe, let me listen to the other tracks again and I'll see if there is anything that pops out at me. Although, this is one of his best songs. I also see this 45 come up periodically on ebay. i think its great you are sharing you massive highlife knowledge with the world. Hi, I recently discovered that I am related to Fax Clark (my fathers cousin) and i can't find much about him online. Can you please tell me more, if you met him?